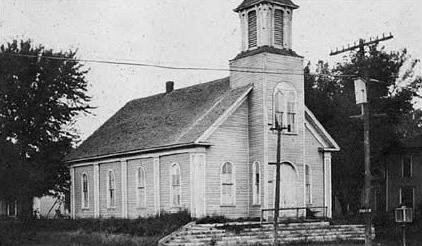 In 1858, a group of Southern Methodists, meeting in each other’s homes, began the Methodist Church of Olathe. In 1869 church members raised money to purchase property at the corner of Cherry and Loula streets where the Methodist Episcopal Church of Olathe was built. This white frame building was remodeled twice, in 1892 and 1907. With continued growth, a new red brick structure was built on the same site and edicated on June 3, 1917. This building served the congregation and community well for many years. Harsh weather conditions over time damaged the walls and foundations and sections of the building were eventually condemned. In 1958, the red brick church was sold and the church on Harrison Street was constructed. 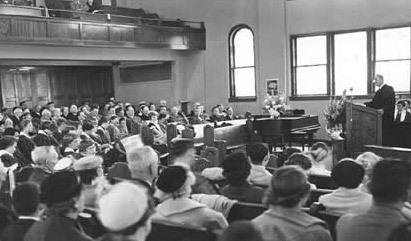 The building, housing the reconditioned organ from the old church, was dedicated on December 7, 1958. On June 1, 1994, First United Methodist Church, which began in 1858, merged with Hope United Methodist Church, which began in 1988. 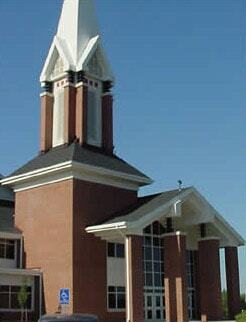 The new church community became Grace United Methodist Church. Today, about 2,200 people call Grace home. We moved into our current site at 11485 Ridgeview Road, Olathe, in the fall of 1999. We celebrate worship every Saturday and Sunday, and offer Sunday School classes for all ages on Sunday mornings at the Ridgeview building. In addition, this building hosts many activities throughout the week. Although we had originally intended to sell the building at 520 S. Harrison in Olathe, God had other plans. Through God’s grace, we have been able to keep that building, now known as Center of Grace. Here, we have continued and expanded our ministries to the community and the world through our outreach programs: English as a Second Language classes for adults and preschool for their children, a clothing closet, community dinners, medical screenings, a partnership with Boys and Girls Club, and much more. Community groups often use our meeting space. Even the sanctuary is home to a congregation for deaf and hard-of-hearing people in our community. We have symbolically blended our past with our present by bringing several pieces from the Harrison building to our Ridgeview campus. The large metal and glass cross from the sanctuary on Harrison hangs in the main foyer. In one of our meeting rooms, you will see reframed stained glass windows from our former chapel. A long-time member had saved a piece of glass from the white frame church; this piece was used as a pattern to create the windows. Three other stained glass windows hang in our three-story foyer along with a fourth window, which is symbolic of the pioneer days. These pieces remind us of the rich history of our church and the beautiful spaces in which we have worshipped over more than 150 years as a congregation, while also giving us hope for the exciting future that is yet to come.